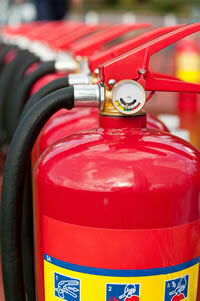 We have extensive knowledge and experience with the providing, servicing and training of fire extinguishers. Below is a guide to different types of fire extinguishers available and their designed usage. The AFFF fire extinguisher (pronounced A triple F) is suitable for use on class A and B fires, which means combustible organic materials such as paper, card, wood and textiles, as well as fires involving flammable liquids such as petrol or oils. They are therefore quite a flexible extinguisher and can be used in any situation where you would normally use a water extinguisher, so are good for general all round use. AFFF stands for Aqueous Film Forming Foam and weight for weight they are more effective than water extinguishers. A smaller and lighter AFFF fire extinguisher should have a higher fire extinguisher rating than a larger and heavier water extinguisher. An AFFF foam fire extinguisher works by smothering the fuel and thereby reducing the oxygen supply so that it cannot continue burning. There is also a cooling effect as the water in the foam evaporates, which also helps to stop combustion and prevent the fire re-igniting. Another benefit is that the foam helps to seal in harmful gases preventing their potentially damaging spread into the area around the fire. They are usually fitted with dielectrical nozzles which make them safer to use around electricity, but they are not meant to be used directly on electrical fires. An AFFF Fire Extinguisher uses what is known as a low expansion foam, which means it expands its size by less than 20 times. This makes AFFF foam very mobile and easy to cover substantial areas quickly. AFFF foam was first developed in the 1960s by the US Navy. The low viscosity of the foam allows it to spread quickly over the top of most burning liquids. A film of water forms underneath the foam, which has a cooling effect and also smothers the fuel preventing combustion and trapping noxious vapours. A further development took place in the 1970s with the development of alcohol resistant foam or AR-AFFF. This is important because some substances could react with the water in normal AFFF foam which then destroyed the structure of the foam. These special new foams were resistant to alcohol and could therefore be effectively used on a wider range of fires. Operating instructions are very much the same as other extinguishers when it comes to fires on wood, paper, etc. Pull out the pin and squeeze the lever, then aim the jet of foam towards the base of the flames, moving it back and forth across the fire. If you are using an AFFF extinguisher on a liquid fire, do not aim directly at the fire or you may disperse and spread it further. Look for a vertical surface that you can aim the foam at so that it can then drop down onto the fire more gently. If the fire is contained in a container with walls, aim at the inside edge of the container and allow the foam to build up and spread across from there. There are certain nationally recognised standards when it comes to purchasing fire fighting equipment, and it is useful to be aware of some of the things you can look out for when you are thinking of buying an AFFF fire extinguisher or any other similar type of appliance. The European Standard, BS EN 3 is a sign that the equipment meets the European standard and that it has passed particular tests of quality and safety. Another standard to look for is the British Standards Kitemark, which confirms that the appliance has met particular requirements set by the British Standard. Water fire extinguishers are used on Class A fires, which usually involve freely burning solid materials such as paper, wood, straw, fabrics and coal. The extinguisher works by spraying a jet of water onto the fire, which penetrates the fire and extinguishes the flames by cooling the burning materials and preventing them re-igniting. Ordinary water fire extinguishers should not be used on fires with electrical equipment because water is conductive so could lead to an electric shock if used on anything electrical. There are several main types of water fire extinguishers, which are the standard ones, spray mist extinguishers and water additive extinguishers. Standard models use ordinary tap water which is sprayed out in a jet under pressure from compressed air. The spray mist type extinguisher produces a fine mist of de-ionised water, which prevents conduction of electricity and risk of electrocution if it is accidentally sprayed on electrical equipment. It should not be used as a solution for dealing with electrical fires, but it does mean it is more versatile and is definitely safer than a standard water appliance if electrical equipment is encountered near the fire. The fine spray also improves the soaking and cooling ability of the extinguisher, though you need to fight the fire from a closer range than with the standard water extinguisher. The water additive type has an environmentally friendly additive in the water which significantly increases the effectiveness of the extinguisher by reducing the surface tension of the water. It means that, compared to a standard water fire extinguisher, a water additive appliance can be smaller and lighter, and still be more effective than the ordinary extinguisher. It often also comes with a spray type nozzle. Their suitability for use on most common materials makes water fire extinguishers the basic fire fighting tool of choice, particularly in offices, warehouses, schools, and many other workplaces. See the main fire extinguisher page for details of how many fire extinguishers to use and where to locate them. Fire needs three things to exist – a source of ignition, oxygen and fuel. All fire appliances work by removing at least one of these elements, without which a fire cannot continue to burn. They apply an agent to the fire that either cools down the fuel so that it can no longer burn, or removes or displaces the oxygen supply so that the fuel cannot ignite. The easiest way to remove heat is to cover a fire with water, which is the basis of water fire extinguishers. The water cools the fuel to below its point of ignition, thus interrupting the combustion cycle. Water fire extinguishers can be of two main types in terms of the main mechanism, stored pressure or cartridge operated. The commonest type of water fire extinguisher is the stored pressure type, in which the extinguisher cylinder itself is pressurised with compressed air. In the cartridge operated extinguishers, there is a small cartridge of compressed gas inside the cylinder. Activating the extinguisher releases the gas into the main container, which pushes the water out of the hose. As safety is of paramount importance in your workplace, you really should not take any chances with the quality of your fire extinguishers. On that one occasion that you need to use it, lives could depend on its effectiveness, so there are a few things you can look for to help ensure that you are buying something that has been made and tested to certain approved standards. BS EN 3 is the European Standard for portable Fire Extinguishers. This standard means that the manufacturer has had to pass certain test criteria to ensure the extinguisher meets a standard level of performance. It is best to go for products with the British Standards Kitemark. This confirms that the product confirms to the British Standard and should be safe and reliable. There is no legal obligation to display this mark, but it does show that the product has passed independent tests by the BSI and reached an approved standard. The letters ‘CE’ on a product indicate that it has met all relevant European directives. Bear in mind that it is not inconceivable that some cheap imported fire extinguishers may have some of these marks on even though they have not actually been approved or met any standards. The Carbon Dioxide Fire Extinguisher is the obvious replacement for the banned Halon fire extinguisher. Carbon dioxide fire extinguishers are designed for use primarily on electrical fires but can also be used on class A, B & C fires (US classes A, B and C). Class B fires include flammable liquids such as petrol, oil, diesel, (excluding cooking oil), and some solid fuels like wax. Fires involving electrical equipment are one of the commonest causes of fire and involve equipment, such as portable appliances, and any electrical wiring or circuitry. Electrical fires do not have an official classification in the UK, but are known as Class C in the US. Being rated as safe on electrical fires (and rated C in the US) signifies that the extinguishing agent is non-conductive. It is because carbon dioxide in non-conductive that it is so suitable for use on electrical equipment, and it doesn’t leave a residue behind like powder or foam extinguisher would, which would be a problem for the delicate workings of an electronic appliance. These properties make carbon dioxide fire extinguishers particularly suitable for office environments and other areas with a significant amount of electronic or electrical equipment. They should not be used on cooking oil fires as the high pressure discharge could splash the burning fat around and spread the fire further. Carbon dioxide fire extinguishers come in various standard sizes, including 1kg, 2kg, 5kg, 10kg, 20kg and 45kg. You can expect the 10kg and above types to be on wheeled trolleys as they are otherwise too heavy to be easily portable. They are usually red in colour with a black panel over the operating instructions. The extinguishers that are 5kg or larger will have a hose attached as well as the horn-shaped nozzle. The carbon dioxide fire extinguisher does not cool the fire down particularly well, so be aware of the danger of the fire starting up again after you think it is out. The carbon dioxide is kept liquidised inside the extinguisher by keeping it under great pressure, and it is not unusual for bits of dry ice to come shooting out of the nozzle because of this high pressure. CO2 fire extinguishers are not that great for use on things like paper and loose materials as the high pressure can scatter the burning matter creating further hazards, and the carbon dioxide may not be able to displace enough oxygen to properly extinguish the fire. The nature of carbon dioxide extinguishers also means that they are not really suitable for dealing with fires outside, so are generally restricted to indoor use. Carbon dioxide fire extinguishers work by producing vaporised CO2 gas from liquidised carbon dioxide. This smothers the fire and starves it of oxygen, preventing combustion. They come with a ‘horn’ that is used to direct the gas. Direct the horn at the base of the flames and move it steadily back and forth across the area of the fire. Carbon Dioxide can lead to asphyxiation if found in quantity in confined spaces, so take care to ventilate the area as soon as the fire is under control. In a work environment, no-one should use a fire extinguisher unless they have received the appropriate training. Basic instructions are printed on the operating instruction panel. An identification sign should be mounted above each carbon dioxide extinguisher to aid easy identification in an emergency. Dry Powder Fire Extinguishers are extremely versatile, as they can be used on Class A, B and C fires (UK) and electrical fires. As well as being suitable for use with flammable liquids, they can also be used on flammable gases, and the non-conductivity of the dry powder makes them safe on electrical fires too. This versatility and their effectiveness in extinguishing fires make them one of the most popular fire extinguishers in the home, as well as the workplace. Dry powder fire extinguishers are the best type of extinguisher for use on flammable liquids and gases. Certain types of dry powder extinguishers are specially designed for use on particular fire types, and have powders geared towards dealing most effectively with these specific situations. For instance, an extinguisher may be developed to be most effective on rapidly knocking back liquid fires (useful in areas such as motor racing) or for dealing with combustible metals. When dry powder fire extinguishers have been used, the deposit they leave behind can be sticky and corrosive which can be particularly damaging if used on electronic equipment, so it does require cleaning up as soon as possible afterwards. Dry powder fire extinguishers are filled with an inert solid (chemical powder) and pressurised with a gas, usually nitrogen. Several different powders can be used, most typically sodium bicarbonate, potassium bicarbonate and monoammonium phosphate. Sodium bicarbonate is a suitable powder because it decomposes at 158 degrees Fahrenheit (70 Celsius) and releases carbon dioxide gas as it decomposes. The carbon dioxide helps to block out the oxygen supply to the fire and the powder forms a coat over the burning fuel, again sealing it off from the oxygen supply. This interrupts the combustion cycle, puts the fire out and prevents it from re-igniting. Monoammonium phosphate is probably the most widespread powder used for workplace dry powder fire extinguishers. As the powder decomposes it produces ‘free radicals’, (unpaired electrons) which interrupt the process of combustion, together with the insulating skin that the powder forms. It is best not to take chances when it comes to the safety of your premises, and if you purchase a fire extinguisher that is not effective, you may not discover this until it is too late. There are certain things to look for when choosing fire extinguishers which will tell you that the appliance meets specific standards or has passed particular tests. The European Standard is one of these and this is known as BS EN 3, so you can look for that on an appliance as a sign that it meets the European Standard. Similarly the ‘CE’ mark on the product shows that it has complied with all European directives relating to fire extinguishers. The other main thing to look for to be sure you are getting a quality appliance is the British Standards Kitemark. This confirms that the product has reached the set of criteria set out by the British Standard. If the extinguisher is going to be situated in a steamy kitchen environment, ensure that it is made from non-corrosive material. Look for a wall bracket or floor stand to be included for fixing. Dry Powder Fire Extinguishers come in a wide range of sizes, mainly between 1 kg and 9 kg, but they are available in smaller sizes and in much larger, wheeled versions for larger scale requirements. No-one should try to fight a fire with any fire extinguisher unless they have previously had appropriate training in the proper use of such equipment. Basic operating instructions are printed on every fire extinguisher, but it is also important to fit an ID notice just above the extinguisher to make it easy to identify in a fire situation. When using a dry powder fire extinguisher, aim the jet at the bottom of the flames and sweep it steadily from side to side. Where spilled liquid is involved, aim at the near side of the fire first and use a fast sweeping motion to work it back towards the far side. If flowing liquid is on fire, aim at the bottom of the flames first, then upwards. If using a dry powder fire extinguisher on an electrical fire, it is strongly advised to switch off the electrical current first.